Cities across South Korea will be hosting multicultural events as part of the Justice Ministry’s Together Day festival. Together Day, in its 10th year, comprises of events taking place over around 10 days, the first of which was a talent contest for foreign students at Soongsil University. Among the biggest events is Busan’s Global Gathering on Sunday, run by the Busan Foundation for International Activities. The gathering predates Together Day, but is now timed to coincide with the event. Held in Samnak Riverside Sports Park, the event gathers hundreds of booths selling multicultural food and products, alongside stage performances and family activities. A similar mix of events will be held the same day in Suwon by the Suwon Migrant Community Service Center at the 1st Suwon Outdoor Concert Hall near the Maetan-dong area southeast of City Hall. Organizers say 5,000 people attended last year’s together day event. Outdoor multicultural festivals will also be held in cities including Jeju City, Yeosu and Daejeon. 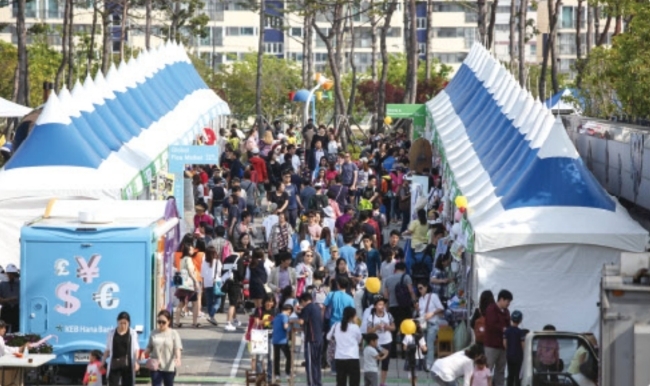 Other events are also part of the schedule, including free health check-ups for foreign residents in Yangju, Gyeonggi Province, on May 23, and a fishing event in Daegu on May 31. In Seoul, an event at the National Theater of Korea will present cultural performances and award foreign residents for contributions to society.